Verdun Experiences, a slim volume written by Margaret Lambie and comprised primarily of an article she wrote for the November 1919 Vassar Quarterly, recounts the College’s special connection with the battered French city of Verdun, which began less than six months after the Armistice of November 11, 1918 ended the First World War that had given the city such tragic and lasting fame. Lambie was one of several Vassar graduates who had been attached to the American Expeditionary Force and served with the Red Cross in France during the last year of the war. 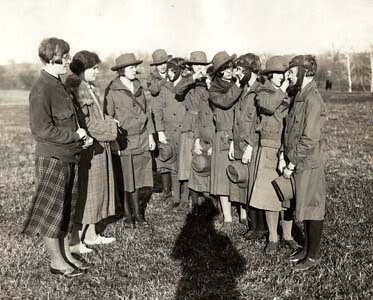 Upon their return home, these women had volunteered to continue their services in whatever way they could be helpful. Thus the Vassar Relief Unit was born. The window panes were oiled paper giving an artistic yellow light, much like that in Oriental houses, which did its unsuccessful best to conceal the dust and cobwebs accumulated during the past four and a half years … We afterwards realized that what at first seemed the minimum of necessities prepared for us as strangers was more than the majority of refugees found upon returning to their former homes. "[W]e were asked to take charge temporarily of the women’s section [of a refugee hotel]. This meant welcoming the women when they arrived tired, cold and hungry, and giving them a bed for a franc a night. Often they had walked many miles upon the battle-fields, searching for graves many of which never could be found." "[I]t keeps one of us busy making change, an accomplishment which the Vassar Unit is painfully acquiring in terms of sous. A large bowl of chocolate can be bought for three cents, café noir is also three with a cent added for milk, sandwiches of corned beef, ham or jam are six cents and a cake of chocolate is sixteen. With warmer weather we plan to sell soft drinks of a variety the French like but which Americans would consider a poor substitute for an up-to-date soda fountain." Ludicrous and also pathetic are some of the offerings made by [American soldiers] to repay our hospitality. They constantly bring us gifts of assorted variety. Here are a few of the tokens laid at our feet! Shells of every size and make, helmets, shovels, munition boxes, old stoves, a dagger, knives, mess kits, dishes, coal, candy, a head light from a French truck to light our hallway, electric bulbs and wire, a piano, an inlaid dresser we use for a serving table, violet and primrose plants for our ‘roof garden,’ a bunch of stunning looking flowers which from their scent must have been skunk cabbages. There was an unsought offer to have our washing done. For transportation, a saddle horse and OD breeches (we didn’t use) and rides in AEF ambulances from Cadillacs to side-cars, trucks and ambulances which we tried to be meticulous in accepting for business purposes only. 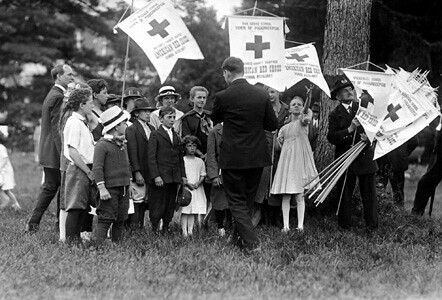 The original members of the Vassar Relief Unit left Verdun on September 1, 1919, having played an important part in the city’s return to a normal existence after the horrors of the war. The Goutte de Lait continued its good work under other Vassar graduates, and ultimately was taken over by the Municipality of Verdun in 1921. More than fifteen years later, it was still in operation, distributing approximately 60,000 liters of milk, mostly free of charge, in 1936. 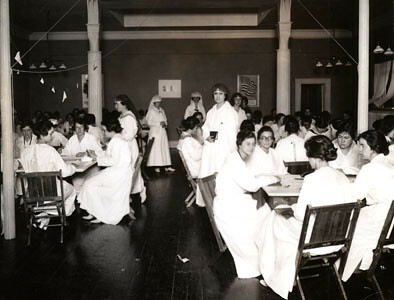 The members of the Vassar Relief Unit were among an estimated 200 of the College’s graduates (four of whom died while in France) who served overseas during World War I. A marble plaque was placed by the French at the Goutte de Lait as a tribute to all of these women. Also in their honor, on Armistice Day, 1920, the French government presented Vassar with a most unusual gift – a 40-ton St. Chamond tank.